EleTab height adjustable standing desk to create a healthy and comfortable work environment for your work fatigue. Sit and stand working status transition offers a wide range of benefits to your health including body circulation and body shape. The height-adjustable standing desk provides ergonomic and comfortable posture to work and relieves problems such as neck pain, eye aches, diabetes and other physical problems that can be caused by prolonged sitting. 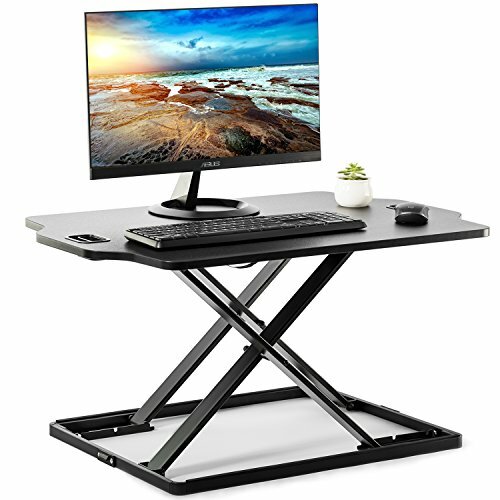 EleTab standing desk with 32-inch desktop area can be based on your needs to create a work area, it supports dual-monitor work and daily necessities. The gas spring device provides noise-free lifting of the Standing desk and the hovering system makes the lifting process smoother. The steel structure can support 22 pounds at fully extended height and stays sturdy and stable. Do not need any assembly, just take the standing desk from the delivery box to place the desktop, you can immediately begin to enjoy the work. 4. Hight range (Display surface height): 11.1"
Sit Stand Desk：The height adjustable standing desk allows you have the opportunity to work in a more ergonomic and comfortable position. Quick Transition：With a built-in gas spring adjustment system, easily raise the height of your tabletop workstation from 1.5" to 16". Slim Shape Design：Lightweight and durable ensure practicality. Lifting mechanism allows computer workstation to elevate straight up and avoid wobbling. Spacious Work Area：The top surface measures 32" providing plenty of space for monitor and laptop setups. The area is large enough to use with a full-size keyboard. Zero Assembly： Comes pre-assembled and ready to use in seconds, place on your existing desk and start organizing your workstation.